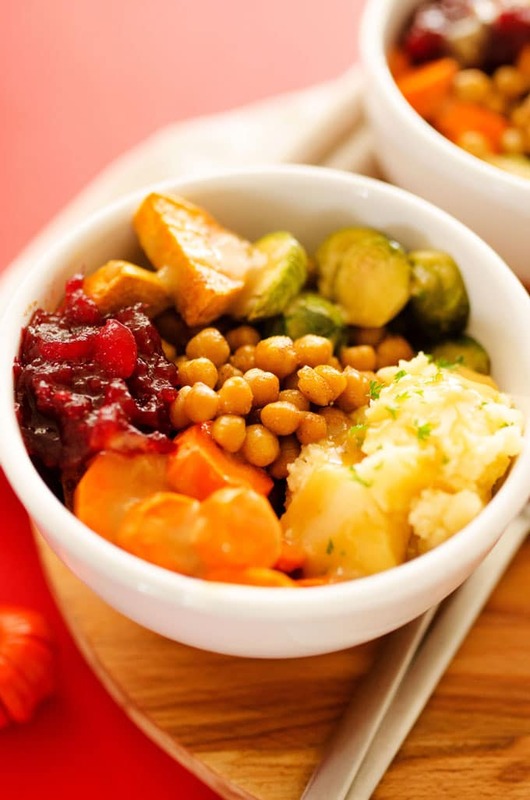 These Vegan Thanksgiving Leftovers Bowls take all of your delicious vegan Thanksgiving leftovers and transform them into a delicious one bowl meal! Pack it with plant-based chickpea power, or substitute in leftover turkey for a comforting meal that’s ready in no time. When you’re an American living outside of America, you celebrate American holidays when it’s convenient. Which is why here in Holland, we celebrated Thanksgiving today. It was the tulip-family’s first ever Thanksgiving so I brought my A game. I made these buttermilk biscuits and this sweet potato casserole with marshmallows (which was obviously a super American show stopper, especially for the guest who’d never eaten a marshmallow (!!!)) and this cranberry sauce and an apple pie that was American on bottom and Dutch on top (i.e. covered in chopped stroopwafels). We went around the table and said what we were thankful for, I educated them on the importance of changing into sweatpants between dinner and dessert in order to fit more food, and it was overall a great American-outside-of-America Thanksgiving. 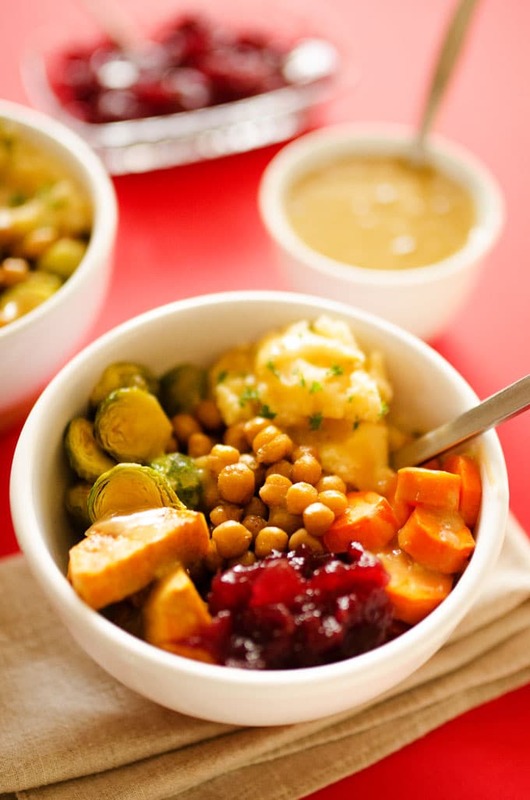 So in preparation for tomorrow (and to prepare you for Friday), today I’m sharing these Vegan Thanksgiving Leftover Bowls! 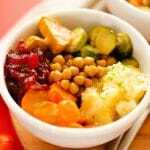 They take everything good about Thanksgiving and transform it into a one bowl meal, drizzled with a smooth and savory vegan gravy. Have a great day of eating and joy tomorrow, and the next day when you’re exhausted and have a tower of leftovers, this recipe has your back. 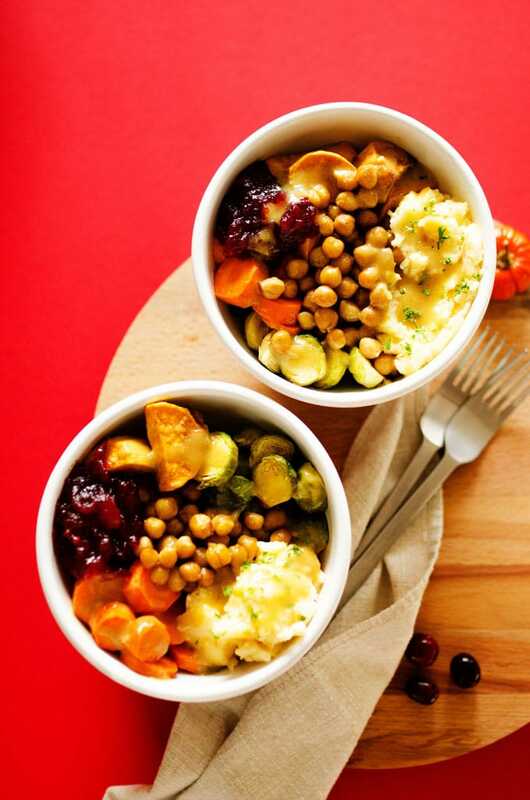 These Vegan Thanksgiving Leftovers Bowls take all of your delicious vegan Thanksgiving leftovers and transform them into a delicious one bowl meal! *If you’re not vegetarian, just use leftover turkey gravy and sub in turkey for the chickpeas! If you have any of these veggies as leftovers from Thanksgiving, just skip the roasting, heat them up, and throw them in with everything else! This recipe was first published on Amanda’s Cookin’, where I’m a contributor. This post contains affiliate links, which means if you buy something from that link I may earn a commission, at no extra cost to you. Thanks for supporting Live Eat Learn and for making these Vegan Thanksgiving Leftover Bowls possible!